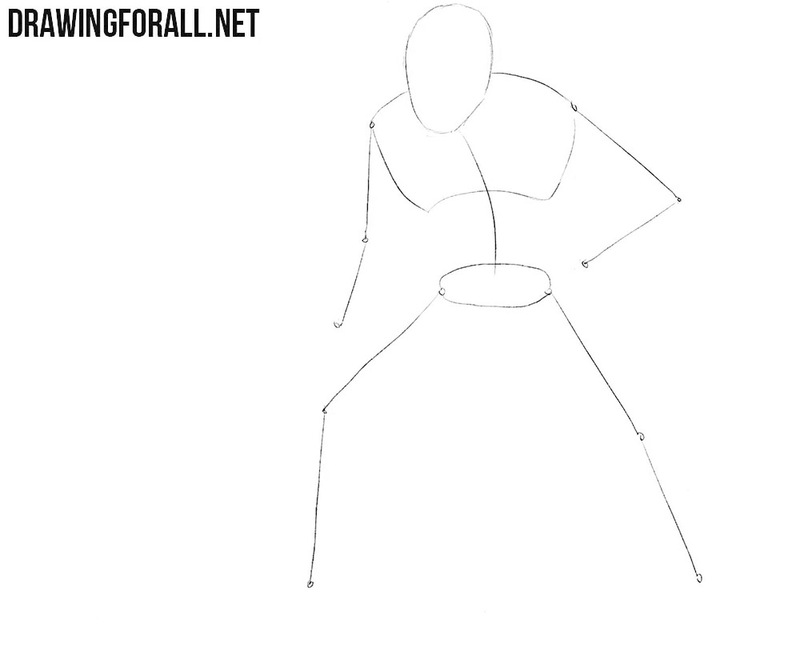 First we will draw a stickman. 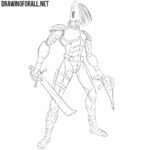 We draw a stickman of the character that looks loke a stickman in armor. 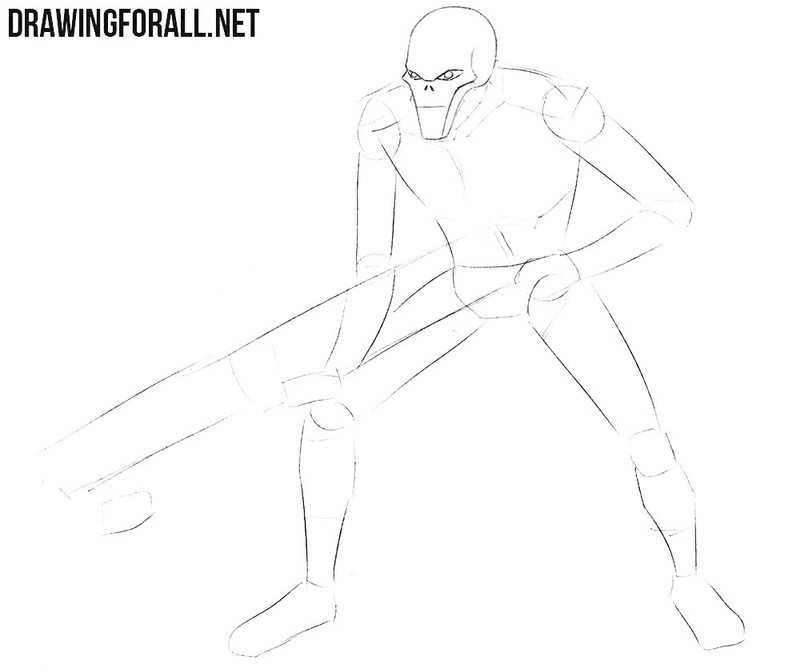 So we need to draw a stickman of thin and hunched character. 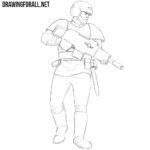 Draw the outline of a round head and spine. On this line sketch out the chest and pelvis. With the help of ordinary short lines, sketch the arms and legs. So, let’s add some “flesh” to the body of our Necron. On the head we draw the lines of symmetry of the face that must crossing in the center of the face. Next we sketch out the body that narrows to the pelvis. Next, we draw the contours of the arms and legs with simple geometric shapes, such as circles and elongated cylinders. In this step we work with the head, rather with face features of Necron. At first draw the eyes and cheeks. Also we draw armor on the torso and shoulders. Do not forget to draw the contours of the gun. Let’s start working with details. 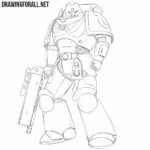 We always begin adding details from the head to the legs, and this drawing tutorial will not be exception. First draw little angry eyes. Next draw the facial features that look like a skull. 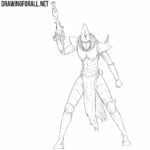 In this step we will draw the body and the shoulders covers the armor. It looks like wide strong plates. Three plates cover the chest and abdomen and one plate is located on each shoulder. Erase all unnecessary guidelines and add short in the neck area lines as in our example. It will be quite a difficult step. Continuing the lines of the shoulders, we carefully draw the contours of the arms. Next, gently draw the mechanic palms that hold the gun. Remove all unnecessary guidelines and move to the legs. 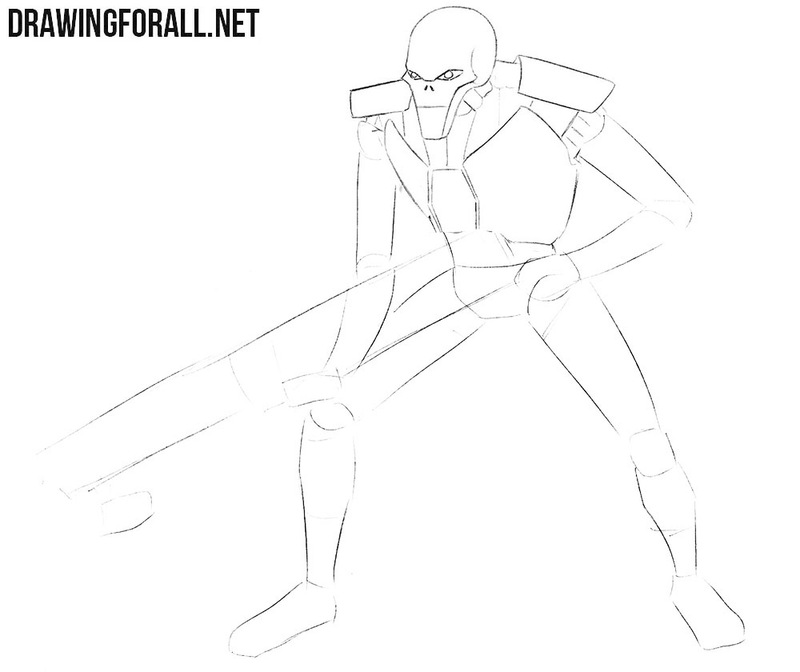 Now let’s get to the arms of our Necron. Carefully draw the outlines of mechanic shoulder and forearm. Below draw hands clenched into fists. 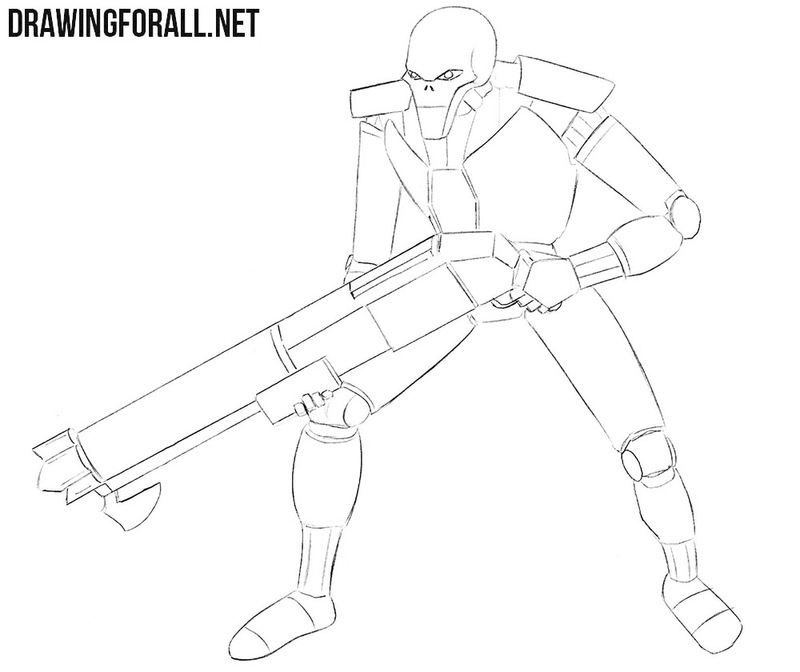 Also in this step we draw heavy massive gun. Please do not scold me, we really do not remember name of this gun. If you know it, please, write it in comment. And of course we do not forget to delete all unnecessary lines from the previous steps. So we have a final step in which we will work with shadows. We have a realistic style of the shadows – so, first we need to determine where from comes the light. Then using light hatching and crosshatching draw shadows to regions where the light doesn’t fall. 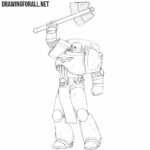 We are very happy that our lessons help you draw very popular unit from Warhammer 40 000. Also we will be very happy if you subscribe to us on social networks and share our tutorials with your friends.